LONDON (AP) -- He's one of the most colorful figures in rock ‘n’ roll, but when it comes to photography, Elton John embraces black and white. Scores of vintage images from the musician's collection are on display in “The Radical Eye,” an exhibition opening this week at London’s Tate Modern. The show displays more than 190 photos that usually line the walls of John's 18,000 square foot (1,670 square meter) Atlanta apartment, one of his several homes. If stark black and white seems too plain a palette for a musician famed for outrageous outfits and opulence, fear not -- there is playfulness and pizazz aplenty in the show. An early purchase was Man Ray’s “Glass Tears,” a close-up of a mannequin's face crying glass beads. John bought it at a Sotheby’s auction in 1993 for almost $200,000, which was then a record for a photograph. The market has moved on, and photos can now fetch millions. John's office won’t put an estimate on his collection. Newell Harbin, director of John's photography collection, says “passionate” is the best word to use to describe him as a collector. 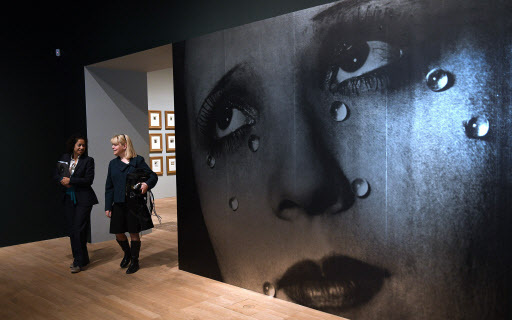 The show includes influential images by street-photography pioneer Andre Kertesz, New York chronicler Berenice Abbott and avant-garde Russian Alexander Rodchenko, as well as Irving Penn’s revealing portraits of artistic figures including Duke Ellington, Salvador Dali, Noel Coward and John himself. Along with the surrealists and experimenters are unflinching documentary photographers including Walker Evans and Dorothea Lange. 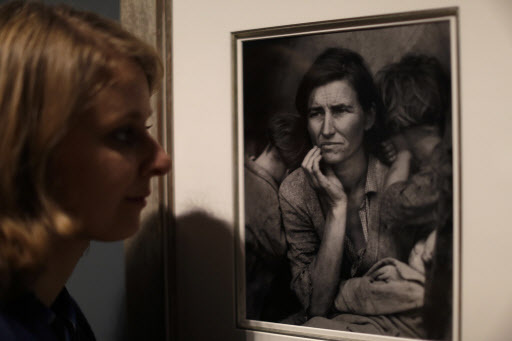 Lange's haunting portrait “Migrant Mother,” on display at Tate, helped alert America to the realities of poverty during the Great Depression. “Her face is so elegant and dignified and yet she’s going through the most horrific of times, trying to feed and clothe her children, he said. The exhibition, which opens Thursday and runs to May 7, provides a glimpse of photographic history as well as of John's artistic tastes. “Photography stopped following the rules of painting and began to experiment and create its own visual language,” she said.